Oil on canvas, attributed to James Sharples, Sr. (no date); Independence National Historical Park. William Few, who represented Georgia at the Constitutional Convention, was a self-made man. Born into a family struggling against the poverty and hardships that were the common lot of the small yeoman farmer, Few achieved both social prominence and political power. Exhibiting those characteristics of self-reliance vital for survival on the American frontier, he became an intimate of the nation's political and military elite. The idea of a rude frontiersman providing the democratic leaven within an association of the rich and powerful has always excited the American imagination, nurtured on stories of Davy Crockett and Abe Lincoln. In the case of the self-educated Few, that image was largely accurate. 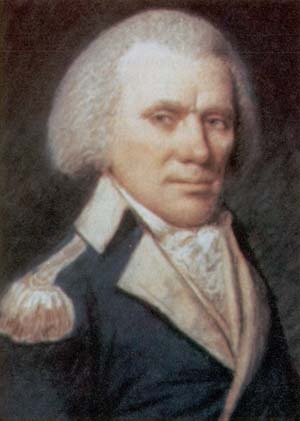 Few's inherent gifts for leadership and organization, as well as his sense of public service, were brought out by his experience in the Revolutionary War. Important in any theater of military operations, leadership and organizational ability were particularly needed in the campaigns in the south where a dangerous and protracted struggle against a determined British invader intimately touched the lives of many settlers. Few's dedication to the common good and his natural military acumen quickly brought him to the attention of the leaders of the Patriot cause, who eventually invested him with important political responsibilities as well. The Few family might well serve as the prototype of those mobile Americans forever seeking better times down the road. Descendents of Quaker farmers who emigrated to Pennsylvania in the 1680s, the Fews lived in northern Maryland, where they eked out a modest living raising tobacco on small holdings. When a series of droughts struck the region in the 1750s, the Fews and their neighbors�actually a sort of extended family consisting of cousins and distant relations�found themselves on the brink of ruin. The whole community decided to abandon its farms and try its luck among the more fertile lands on the southern frontier. The group ultimately selected new homesites along the banks of the Eno River in Orange County, North Carolina. Here young Few developed the skills expected of the eighteenth-century farmer. Such a life left little time for formal schooling, although the community hired an itinerant teacher for a brief time in the 1760s. From this experience Few obtained a rudimentary education that led to a lifelong love of reading. Essentially a self-educated man, Few also found time to read law and qualify as an attorney despite a full-time commitment to the unrelenting demands of agricultural toil. In time the Few family achieved a measure of prosperity, emerging as political leaders in rural Orange County. Like many other western settlers, however, the family became involved with the Regulators, a populist movement that grew up in reaction to the political and economic restrictions imposed on the frontier farmers by the merchants and planters of the tidewater area. By 1771 protest had become confrontation, and a large group of mostly unarmed westerners gathered to clash with North Carolina militia units at the "battle" of the Alamance. The uneven fight ended in total victory for the militia, although most of the frontiersmen's demands for political representation and economic relief eventually would be met by the state legislature. More immediately, one of Few's brothers was hanged for his part in the uprising. The rest of the family fled to western Georgia, leaving Few behind to settle their affairs and sell their property. These antagonisms within North Carolina began to evaporate as American opinion turned against the imperial measures instituted by Great Britain in the 1770s. Both the eastern planters and the new settlers found repressive new taxes and restrictions on western expansion at odds with their idea of self-government, and Patriot leaders were able to unite the state against what they could portray as a threat to the liberties of all parties. By the time open warfare erupted in Massachusetts in 1775, North Carolina had begun to revitalize its militia formations, hastily training them in the linear tactics used by British regulars as well as in the techniques of frontier warfare employed by their traditional Indian foes. Few participated in this training as one of the first men to enlist in the volunteer militia company formed by Patriot leaders in Hillsborough. Typically, Few's unit received its tactical instruction from a veteran of the colonial wars, in this case a former corporal in the British Army who was Wed by the company as its drill sergeant. Citing the press of family business, Few rejected the offer of a captaincy in one of the first units North Carolina raised for the Continental Army in the summer of 1775. But when he finally settled the family's accounts the next year and joined his relatives in Augusta, Georgia, where he opened a law office, he quickly placed his newly acquired military knowledge at the service of the Patriot cause in his new state. Georgia organized its citizen-soldiers on a geographical basis, forming local companies into a regiment in each county. Few joined the Richmond County Regiment, which his older brother commanded. For the next two years Few's military duties consisted of attending military assemblies where he instructed his friends and neighbors in the skills he had acquired in the North Carolina militia. Only in 1778, when Georgia faced the threat of invasion by a force of Loyalist militia and British regulars based in Florida, was Few finally called to active duty. The Georgians' first military campaign ended in disaster. A force of state and Continental units successfully combined to repulse an enemy raid on Sunbury near the states southeastern border, but a counterattack orchestrated by Major General Robert Howe of the Continental Army and Governor John Houston bogged down before the Patriots could reach St. Augustine. Few, now in command of a company of Georgia militia, watched the collapse of the campaign's logistical support and then the disintegration of the force itself, as senior officers bickered among themselves and as disease began to decimate the units. Only half of the American soldiers survived to return home. At the end of the year a sudden amphibious invasion by British forces resulted in the capture of Savannah and the destruction of the rest of the Continental units under Howe and most of the eastern militia formations. Armed resistance to the British continued in the western part of the state, led by the Richmond County Regiment. Throughout 1779 the regiment, with Few now second in command, frequently turned out to skirmish with probing British units, eventually forcing the enemy to abandon Augusta, which the British had captured soon after the fall of Savannah. The success of the citizen-soldiers in defending their own homes began to reverse the fortunes of war in Georgia, prompting the new Continental commander in the region, Major General Benjamin Lincoln, to take the offensive. Lincoln combined his continentals and militia units from Georgia and South Carolina with a French force newly arrived from the Caribbean to lay siege to Savannah. He immediately encountered difficulty, however, in coordinating the efforts of his diverse forces. The French, under pressure to terminate operations quickly in order to move on to other assignments, persuaded Lincoln to launch a full frontal attack. The result was a bloody defeat, but Few's militiamen participated in a successful rear-guard action that shielded the retreat of the American units. In the aftermath of the battle his regiment was posted to the frontier where the Creek Indians, interpreting the defeat before Savannah as proof of the Georgians' weakness, had taken to the field in support of British forces. Enemy operations in Georgia in 1779 were part of a new "southern strategy" by which the British planned to use the state as a base for conquering the rebellious colonies in a sweep up from the south. Few's military service in the later years of the war proved critical both in frustrating this strategy and in enhancing his credentials as a state leader. The western forces, in which Few's regiment played a prominent role, kept the British from consolidating their position. The area never developed into a secure Loyalist base, and British troops needed for subsequent operations against the Carolinas and Virginia had to be diverted to counter the threat posed by the frontier militia units. Few emerged as a gifted administrator and logistician in this demanding and difficult effort to maintain a viable military force in Georgia. He also turned into a bold, innovative partisan commander. Experience and innate common sense enabled him to develop patience, preserve his forces for key attacks, and then pick his time and place to defeat small enemy parties without unduly risking the safety of his men. Most important, he displayed the raw physical stamina required to survive the serious hardships of guerrilla warfare. Military success went hand in hand with political service. During the late 1770s Few also won election to the Georgia Assembly, sat on the states Executive Council, acted as state surveyor-general, represented Georgia in negotiations with the Indians that succeeded in minimizing the danger of frontier attacks, and served as Richmond County's senior magistrate. Few's growing political prominence and undisputed talent for leadership prompted the state legislature in 1780 to appoint him to represent Georgia in the Continental Congress. Few served in Congress less than a year when, in the wake of General Nathanael Greene's successful effort to drive the British out of most of Georgia, Congress sent him home to help reassemble Georgia's scattered government. This task accomplished, Few returned to Congress in 1782, where he remained to serve throughout most of the decade. While a member of that body, Few was asked by his state to serve concurrently in the Constitutional Convention that met in Philadelphia in 1787. This dual responsibility caused him to split his time between the two bodies and therefore to miss portions of the constitutional proceedings. Nevertheless, Few firmly supported the effort to create a strong national union and worked hard to secure the Continental Congress' approval of the new instrument of government. He also participated in the Georgia convention in 1788 that ratified the document. Georgia promptly selected Few to serve as one of its original United States senators. Planning to retire from politics at the expiration of his term in 1793, he bowed instead to the wishes of his neighbors and served yet another term in the state legislature. In 1796 the Georgia Assembly appointed him as a circuit court judge. During this three-year appointment he not only consolidated his reputation as a practical, fair jurist but became a prominent supporter of public education. His efforts to establish a state university indicated the importance this self-educated man gave to formal instruction. At the urging of his wife, a native New Yorker, Few left Georgia in 1799 and moved to Manhattan. There, he embarked on yet another career of public service, while supporting his family through banking and the occasional practice of law. His new neighbors promptly elected him to represent them in the state legislature and later as a city alderman. He also served for nine years as New York's inspector of prisons and one year as a federal commissioner of loans before finally retiring to his country home in Dutchess County, New York. Few's career clearly demonstrates the potential for economic and social advancement that existed for men of ability in colonial society. More importantly, it revealed the willingness, common among many of these self-made men, to place their talents at the service of the nation in war and in peace.